Ffestiniog & Welsh Highland Railways01766 516000work Steam RailwayThe Ffestiniog Railway is the oldest independent railway company in the world, established in 1832. The railway takes you on a 13½ mile journey from the harbour in Porthmadog to the slate-quarrying town of Blaenau Ffestiniog. Our historic trains climb over 700 feet from sea level into the mountains through tranquil pastures and magnificent forests, past lakes and waterfalls, round horseshoe bends (even a complete spiral) clinging to the side of the mountain or even tunnelling through it. Single trip 1 hour and 10 minutes, return trip 2 hours and 30 minutes. Group rates available, advanced group booking essential. One of the famous 'Great Little Trains of Wales'. 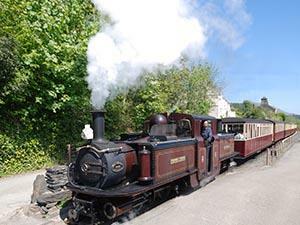 Operating days for the Ffestiniog Railway; see website for train times. Winter services from 4th November 2019 are still under consideration. Updated timetables will be issued in due course. For all fare details, please refer to website.